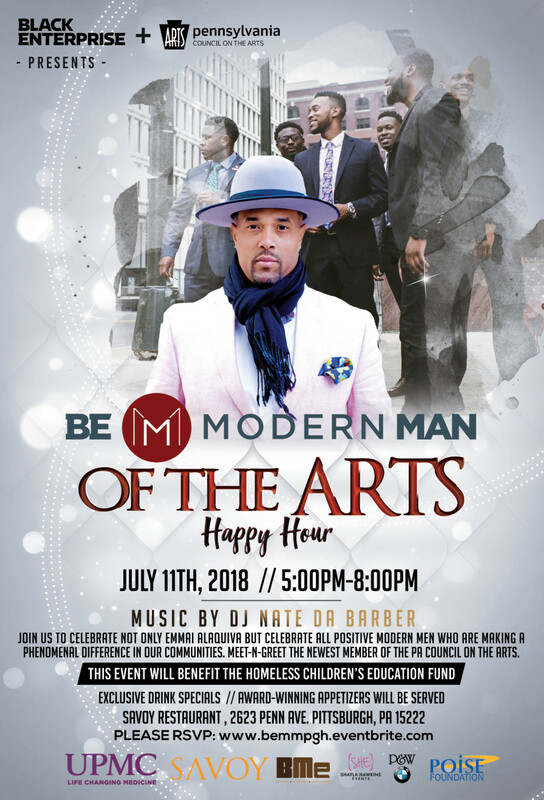 (PITTSBURGH, PENNSYLVANIA) Black Enterprise and The Pennsylvania Council on the Arts proudly support Emmy Award-winning Director Emmai Alaquiva is celebrating his gubernatorial appointment to the Pennsylvania Council for the Arts and as well as being selected as a Be Modern Man by Black Enterprise Magazine with a meet and greet happy hour on July 11, 2018, at Savoy Restaurant (2623 Penn Ave, Pittsburgh, PA 15222), starting promptly at 5pm. The meet and greet happy hour will specifically benefit the Homeless Children’s Education Fund, to support the educational needs of children experiencing homelessness in Allegheny County. “The Homeless Children’s Education Fund is an advocate for some of Pittsburgh’s most vulnerable youth,” said Alaquiva. The funds will continue to support their mission of supporting youth who are or were homeless, a situation that Alaquiva can relate to, as he was once homeless. In early 2018, Alaquiva was appointed to the Pennsylvania Council for the Arts by Pennsylvania Governor Tom Wolf. In this role, Alaquiva will help oversee art funding for state artists and organizations. Alaquiva’s appointment recognized his artistic abilities and his community service, namely Hip-Hop On L.O.C.K. the hip-hop arts education program he founded in 2007. “We are tremendously pleased with the recent additions to our Council,” PCA Executive Director Karl Blischke said. “These individuals uniquely contribute to their communities’ arts and cultural landscape, and I look forward to the valuable perspectives they will bring to the Council’s work. Additionally, the meet and greet happy hour celebrates Alaquiva’s recent accomplishment as a Black Enterprise Modern Man of Distinction. “My accomplishments are not exclusive to myself. I take in pride in being able to be a vessel for the arts community, and a champion for those that are using their talents for self-expression,” Alaquiva said. Sponsors include UPMC Health Plan, Savoy Restaurant, Shayla Hawkins Events, BMe, The Poise Foundation and P&W BMW. For more information, please contact Victoria Snyder, Executive Vice President, Ya Momz House, Inc. vsnyder@yamomzhouse.com or 412-974-8215. © 2017 COPYRIGHT. BME NETWORK. ALL RIGHTS RESERVED.